Dominicans resident overseas have begun to mobilize their efforts to assist Dominica in the wake of the recent earthquake and landslides. The Commonwealth of Dominica Ontario Association (CDOA) will be holding a general meeting this Sunday November 28th to inform the public of where drop of points are for relief supplies and to seek volunteers to package these items. Individuals are requested to supply perishable items, which will go mainly to the Portsmouth Hospital. In Washington, the Dominican Embassy is calling Dominicans to attend a meeting at the embassy on Tuesday November, 30 at 7:00 pm to discuss giving assistance to the country. Remy Roker of AMVI Sunny 99.5 radio station of the United States Virgin Island has invited Dominicans to call in to his radio show on Saturday morning. Dominicans are requested to call in at telephone number 340 773 9951 where the general public will be requested to give assistance to Dominica. The Dominica Academy of Arts and Sciences (DAAS) is also calling on structural engineers throughout the Diaspora who may be able to assist in Dominica to sign up with the academy. An effort is being made to mobilize the necessary resources, which will permit these engineers to travel to Dominica. A total of seven Engineers are currently on island to assess the extent of the damage to roads and physical structures caused by the earthquake which struck Dominica on Sunday. The engineers have been provided by the Caribbean Disaster Emergency Response Agency (CDERA) and the Government of Trinidad and Tobago. The Engineers are expected to inspect the Portsmouth Hospital as well as a number of public buildings and private property affected by the passage of the earthquake. The engineers are expected to present a report to Cabinet on Thursday, November 25th 2004. In addition, a team from the Pan American Health Organization (PAHO) is currently in Dominica to assess for themselves the impact of the earthquake on the health facilities, mainly in the North of Dominica. Meanwhile the road to the eastern village of Grand Fond is now open after its residents had been cut off from the rest of the country since last weekend as a result of landslides triggered by persistent heavy rains. Meanwhile the Au Delice Road in the east is impassable after a piece of the road collapsed. However, the Ministry of Communications, Works and Housing has cleared most of the landslides in other parts of the country in the last few days. On Tuesday, November 23rd 2004, Prime Minister, Hon. Roosevelt Skerrit was able to witness the airlifting of essential food and medical supplies to the communities of Grand Fond, Good Hope, San Sauveur and Petite Soufriere. A day after a 6.0 earthquake rattled Dominica, officials of the International Monetary Fund, granted the Roosevelt Skerrit administration a one-year extension to repay its loans. The executive board of the IMF, in a statement yesterday, made the announcement, explaining that though about US$2.0 million was due by December 2, 2004 will now be due next December. Additionally, the second payment will be due in March 2006 and every two months there after. Two days after the massive quake rocked the island of Dominica, persons in the North East of the island continue to report almost nonstop aftershocks in their area. Earlier today, terrified students of the Portsmouth Secondary School fled their classrooms after their building began swaying dangerously from side to side. A student in a telephone message to a local radio station, reported teachers bursting into tears as they ordered students to leave their classrooms. It was not clear if the students would be allowed to return to school tomorrow. Residents continue to express fears about the structural integrity of buildings even as structural engineers from neighboring countries arrived in Dominica to make an initial assessment. The government was also appealing to Dominican strutural engineers resident in other countries to offer their services to the country. The Dominica government today reported that much needed food supplies would be airlifted by helicopter to the villages of Grand Fond, Good Hope and Petite Soufriere. The villages have been virtually cut-off from the rest of the island in the aftermath of over a week of heavy rainfall. Government has secured the services of a helicopter from Barbados to assist in the airlift. Supplies of rice, sugar, flour and other basic food items were donated by local businesses and will be delivered to the villagers of the affected areas. Meanwhile, fresh landslides swept away equipment that was being used to clear away debris in the Odelice area of the country. The operators of the equipment were originally feared dead, but were subsequently found alive and unhurt. Hundreds of landslides remain to be cleared all over the island, but every effort was being made on Monday to get the country back to normal. Workers reported to government offices and business places while schools reoponed with the exception of those in the North Eastern part of the island. The ministry of education however, announced that all the schools in that part of Dominica would reopen on Tuesday November 23, with the exception of the Portsmouth Roosevelt Douglas primary school and the Calibishie government school. Both schools will remain closed on account of structural damage from Sunday's earthquake. State of Emergency Declared in Certain Areas of Dominica After Days of Heavy Rainfall Earthquakes and Massive Landslides. At about 7:45 A.M on Sunday November 21, 2004, a massive earthquake rocked the island of Dominica completely destroying the Vielle Case Catholic church and causing structural damage to several buildings. Initial reports put the magnitude of the quake at 6.0 on the Richter scale. This was followed by several smaller tremors throughout the morning. There were no immediate reports of casualties. The center of the quake was reported to be 10 kilometers off the North East coast of Dominica and was 18 kilometers deep. Before the major quake, at 7:39 A.M there was a foreshock, which measured 3.5 on the Richter scale. The highest recorded aftershock was at 4.9. Residents of Montserrat, Guadeloupe, Martinique and St.Lucia also reported feeling the quake. The Dominica government has announced that the local economy should grow by at least 2 per cent in 2004. According to a government spokesman, the projection is based on the findings of an International Monetary Fund (IMF) mission, which visited Dominica from 18 to 29 October to review the country's economic performance, and revise targets under Dominica's Poverty Reduction and Growth Facility (PRGF) agreement with the IMF. The government attributed the better-than-expected projection to fiscal discipline and increased tax collection. The government indicated that taxes on income and profits, sales taxes and taxes on international trade and transactions were in all significantly in excess of expectations, thus reflecting increased levels of economic activity. The release declared that "the government has continued to maintain discipline" on expenditure and that the economic indicators reveal that the economy is on an upward growth trajectory, demonstrating that the negative growth rates of 2001-02 are now well in the past. Dominica is mourning the death of its first Premier, Edward Oliver Leblanc who died at his home in Vielle Case on Friday. E O Leblanc was a much beloved leader of the Dominica Labour Party , who championed the cause of the common man and was well loved throughout the island. In 1961, he won a crushing electoral victory, and became Chief Minister and Minister of finance in the new government, which had ousted F A Baron�s Dominica United Peoples Party. He again won by a landslide in the 1966 general elections and when Dominica attained Associated Statehood in 1967, he became the country�s first Premier. After winning the 1971 elections, he resigned in July 1974, having vowed not to serve more than two terms. E O Leblanc resigned from party politics and retired to his home in Vielle Case where he remained largely out of sight of the public until his death on Friday. Leblanc was credited for developing a cultural nationalism, which promoted National Day of November 3 as an annual cultural festival. He fought long and hard for a West Indian federation, and was a well beloved leader especially in the rural areas of Dominica. (More information on the life of E O Leblanc will be in forthcoming issue of theDominican.net). Former United Workers Party Candidate for the Pointe Michel/Soufriere Constituency, Dennis La Bassiere, died in a traffic accident Thursday October 28, 2004. La Bassiere Pajero collided head-on with a dump truck somewhere on the Ponte Case Road and he died in the ambulance on his way to the Princess Margaret Hospital. La Bassiere owned the New Found Land Estate and was a prominent local bussinessman. The Dominica Association of Seventh-day Adventists in the U.S. (DASUS) will host its First Annual Dominica Day under the theme "Going Home" on Saturday, November 6, 2004 at the Bronx Temple of Seventh-day Adventists, 495 Willis Avenue, Bronx, New York, 10455, to coincide with the 26th Anniversary of Dominica's Independence. DASUS was created this past summer to provide a forum for Dominicans of the Seventh-day Adventist faith and others to come together for events and projects that benefit causes at home. The idea for the organization had been percolating for several years; however, a group of Dominicans began collaborating recently to develop a formal organization. DASUS' immediate goal is to create an annual culturally relevant formal worship service for the thousands of Dominican Seventh-day Adventists in the United States. Future plans include the formation of Chapters around the country, and a cause-related fundraising component. Events for Dominica Day will commence with the traditional Sabbath School segment. The formal worship service is scheduled for 11:00 a.m. Ambassador Crispine Gregoire and Consul General Zilpha Theodore have been invited to officially welcome and address the 600 or more Dominicans from around the tri-state area and the northeast region who are expected to attend. Pastor Darius A. Lecointe, JD, PhD, a dynamic Seventh-day Adventist minister and scholar will be the featured speaker for the formal worship service. His message is entitled 'Going Home: All for Each and Each for All'. Other notable Dominican Seventh-day Adventist clergy and musicians will also participate in the service. A special Dominica Day offering will be collected. An Independence Day Luncheon, featuring some authentic Dominican dishes, will follow the worship service. The daylong celebration will continue with an old fashioned "MV Meeting" for the Adventist Youth Program which is scheduled for 4:30 p.m.
A Biblical skit, singspiration of home favorites and other activities will be included in the program. The cultural component of DASUS' Dominica Day will take the form of a social, featuring favorite ring games, folk songs, stories, poems and delectable treats from home. "We intend to make this a grand, wonderful, inspirational Dominican celebration," said DASUS Acting Chair, William Bellot. "We look forward to welcoming all Dominicans to this daylong event as we commemorate the 26th Anniversary of our Independence and give thanks for blessings of home." Prime Minister Roosevelt Skerrit addressed hundreds of Dominicans in New York and Toronto recently. Skeritt was in North America to address the United Nations General Assembly and used the opportunity to meet with overseas based Dominicans. He generally gave an update of the economic and social situation in Dominica, and urged Dominicans to continue to make a contribution towards the development of their country. Hurricane Ivan made a direct hit on Grenada with ferocious winds of up to 130 mph, killing three people and injuringmany more. Ivan collapsed concrete homes into piles of rubble and hurled dozens of the island's landmark red zinc roofs through the air. The most powerful storm to hit the Caribbean in 14 years also damaged homes in Barbados, St. Lucia and St. Vincent and left thousands without water, electricity and telephone service, just days after Hurricane Frances rampaged through. Ivan strengthened even as it was over Grenada on Tuesday, becoming a Category 4 storm and getting even more powerful as it headed across the Caribbean Sea, passing north of the Dutch Caribbean islands of Aruba, Bonaire and Curacao. By early Wednesday morning, Ivan was headed directly for Jamaica and is expected to pass directly over the Island on Saturday before heading further North to the United States. Gordon Henderson is best known for developing the unique cadence-lypso music style, which fused calypso music with the distinctive Creole (cadence) mix. The music was largely popularized by the Exile One group, which he headed, throughout the Caribbean and influenced groups like Kassav, Gazoline and other famous French groups. In accepting the award, Mr. Henderson made an impassioned plea for a greater appreciation and awareness of the music art form in the Caribbean in fostering Caribbean unity. The other awardees were Dr. Cedric Lynch from Jamaica who is a leading educationist in the Washington area, and Dr. Thelma Thompson also of Jamaica who is currently president of the University of Maryland Eastern Shore. The CAIO has been in existence for the past 46 years and have honored several other Caribbean greats including Gordon K. Lewis, Robert Marley, Sir Arthur Lewis and the Mighty Sparrow. The Guiness Book of World Records have officially declared Dominica's Prime Minister Roosevelt Skeritt as the world's youngest Prime Minister. He was only 31 (born June 8, 1972), when he was appointed Prime Minister on January 8, 2004, following the sudden death of Prime Minister Pierre Charles. The only other World Record in which Dominica features is for recording the deepest dive by a mammal. In 1991 scientists from the Woods Hole Oceanographic Institute recorded the dive of a bull sperm whale (Physeter macrocephalus) off the coast of Dominica, to a depth of 2,000 m (6,500 ft). The dive lasted one hour 13 minutes. The British government intends to crackdown on British hospitals that are poaching nurses from developing countries. This comes amidst complaints from Aids-hit African nations which have said that they are being stripped of vital staff. Three years ago, the government banned the National Health Service (NHS) from recruiting nurses from poorer countries on ethical grounds, but the ban has been flouted. Many nurses from the Caribbean have also been employed by the NHS in recent years. But Dominican Health minister Herbert Sabaroche, told BBC Caribbean Radio he is not unduly worried by what appears to be an increase in the migration of nurses within the eastern Caribbean. "This is an indication that we have been producing some of the best nurses in the world and they've been attracted to other parts of the world to provide services elsewhere," he told BBC Caribbean Radio. He said in recent years, 55 of the 378 nurses at the country's main hospital have gone to work in the UK, but the government was taking steps to guard against a nursing shortage. Bold steps "We realise we had to take some bold steps to not only stem but complement the kind of nursing service we provide in Dominica," Mr Sabaroche said. "The government has taken the decision to increase the retirement age of nurses from 55 to 60." Mr Sabaroche said it was inevitable that people would move around the world to find employment, and pointed to ways that these people have contributed to the Dominican economy. "When they are out there they still contribute to the development of the nation through sending back money for their families, and gaining further experience," he said. "We do not want to say we are putting restrictions on anyone but would want to know we are moving in a direction where we can benefit and the other countries can benefit as well but we need a level of assistance." The Health Minister said he hopes the developed nations who are using the services of Dominica�s nurses will contribute to their education and training. 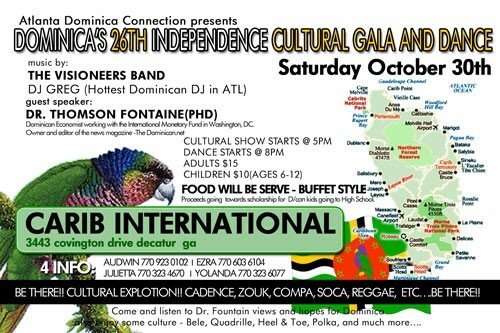 The Caribbean American Intercultural Organization (CAIO) will honor Dominican-born Gordon Henderson at its Annual Independence Awards Luncheon on Saturday, August 28, 2004, at the Marriott Wardman Park Hotel, Washington, D.C.
Mr. Henderson and his EXILE ONE band became legendary for having created �Cadence-lypso�, defined by him �...as a synthesis of Caribbean rhythmic patterns�. The music combined the anglo-calypso with the Creole in a manner that Haitians as well as Jamaicans could identify..., and �Cadence� revolutionized Caribbean music. Each year CAIO, which was founded on June 25, 1958, celebrates the Anniversary of Caribbean Independence with a week of activities culminating with an Awards Luncheon or Dinner on the fourth Saturday in August. The Mayor of the District of Columbia issues a Proclamation declaring the week �Caribbean Independence Week. in the District of Columbia�. Our theme for 2004 is �Promoting Caribbean Unity�. Other honorees will be: Cedric M. Lynch, Ph.D. of the D.C. School System and Thelma B. Thompson, Ph.D., President, University of Maryland Eastern Shore. Please join us in celebrating the Forty-second Anniversary of Caribbean Independence. For information contact: 301-949-4249; 301-681-5938. From October 29 to November 01, 2004 Dominica will come alive to the eighth World Creole Music Festival. The event was officially launched on Monday by Executive Director of the Dominica Festivals Commission Jeffrey Brisbane. A highlight of this year�s event is the reuniting on stage of the Belles Combo band on the second night of the festival. On the first night of the Festival performers will include: Sweet Mickey, Escale, featuring Princess Lover and Jean Marie Regald, Camela (a salsa band from Cuba) and the First Serenade. On Saturday, day two, Elephant Man of Jamaica will headline along with Ti Vice, Ruppee of Barbados, Michele Henderson and Belles Combo. The final show on Sunday will feature Ceramix band from Portsmouth, Carimi, Dominique Coco, Soukous Stars, and Swinging Stars featuring calyposonians Hunter, Daddy Chess, Observer and Dice. Ticket prices will cost $95 EC (US $35) per night compared to last year�s $75 EC dollars. Season tickets cost $200 EC. The World Creole Festival is the leading event of its kind and attracts thousands of visitors annually. It will be preceded by four days of �Creole in the Park� organized by Cable and Wireless. 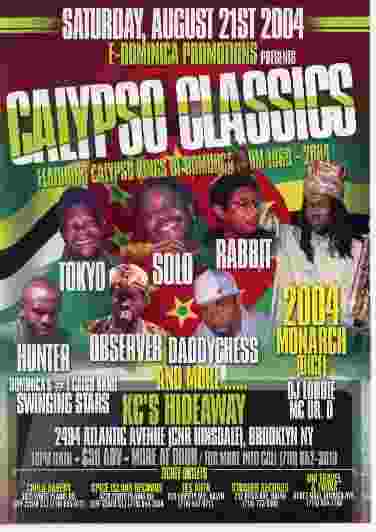 Several of Dominica�s leading Calypsonians will meet on August 21, 2004 in one of the biggest calypso shows ever held in the United States. Performers include this year�s reigning Monarch Dice, Hunter, Solo, Daddy Chess, Tokyo, Observer, Rabbit and others. Swinging stars will accompany the singers.